Seems like I’ve been hearing “so” more often these days in everyday American conversation. So I started thinking about “so.” So I looked it up. As is so often the case with multi-purpose words, definitions of “so” are long and contain many illustrative examples, from the King James Bible forward. She’d never felt SO thrilled. How can you be SO mean as to call him a cretin? It’s about SO big around. SO am I. SO is she. SO are they. And SO began a story with no end. 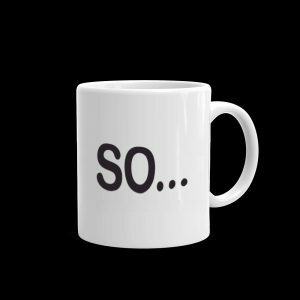 We’d all be so lost without “so.” And now I think the word is gaining favor in yet another usage: a word to introduce an explanation. I heard Neil deGrasse Tyson use it this way in a video I watched the other day. A salesman at Home Depot did, too. I noticed it when a coffee barista and a car mechanic both spoke it right before they answered a question. In the case of the salesman at Home Depot, I had just asked him whether or not a particular type of carpet was made of nylon. In the video I watched, Neil deGrasse Tyson was answering a question posed by Larry King. The others all began explanations in similar ways, using “so” as an intro word. “SO: The first word of any answer given by a know-it-all douchebag, said to give the effect that they were already speaking when you asked your question or requested their opinion, in order to feign superiority or to imply that they knew what you wanted to know before you inquired. Clearly, I am not the first person to have noticed this way to use “so,” although I have not gone so far as to take offense at the people I’ve heard using it, even when they were talking to me. SO, now I am keeping an ear out for this apparently popular and possibly condescending use of “so.” I’m trying to figure out whether it’s favored by certain age groups, ethnic groups, or genders. Is it urban, rural, regional, or in use across the land? Does it appear only in conversation, or does it show up in written dialogue as well? That’s the real reason I’d like to know. When I’m making up explanations to put in fictional people’s mouths, would they be more realistic if I preceded them with “so?” Should I reserve it for twenty-something salespeople, celebrity scientists, young auto mechanics, and coffee baristas? I’m wondering if I should avoid it altogether. So, I’d feel terrible if I unwittingly crafted a know-it-all douchebag. So, I am not sure I use So in this way. So, do I? No, I don’t think you do. I’ll be listening, though!